CHEM 104. Introduction to Water Chemistry. This course provides an introduction to the fundamental concepts of chemistry through the context of water, a pervasive aspect of daily life. Why is water blue? Is the composition of an elephant 70% water? How can a water strider walk across the surface of a pond? Does hot water freeze faster than cold water? Students explore these scientific ideas facts in order to more deeply understand diverse facets of chemistry. Several hands-on activities ware aligned with discussions, creating opportunities to communicate scientific concepts, data, and ideas, and ultimately reinforce chemistry learning. Not open to students who have received credit for CHEM 107A or 108A. Enrollment limited to 39. [S] X. Xu. CHEM 107A. Atomic and Molecular Structure/Lab. Fundamental concepts underlying the structure and behavior of matter are developed. Major topics include states of matter, atomic structure, periodicity, and bonding. This course, or its equivalent, is a prerequisite for all advanced courses in chemistry and biological chemistry. Laboratory: three hours per week. Enrollment limited to 39 per section. [S] [L] [Q] Normally offered every year. M. Côté, G. Laurita, L. Mandletort, C. O'Loughlin. A continuation of CHEM 107A. Major topics include thermodynamics, kinetics, equilibrium, acid/base behavior, and electrochemistry. Laboratory: three hours per week. Prerequisite(s): CHEM 107A. Enrollment limited to 39 per section. [S] [L] [Q] Normally offered every year. M. Côté, G. Laurita, T. Lawson, L. Mandletort. CHEM 125. Bioenergetics and Nutrition. Living organisms require nutrients extracted from the environment to support the chemical reactions necessary for all life processes including development, growth, motion, and reproduction. Maintaining the chemical reactions that allow the web of life to continue to exist on Earth demands a continuous input of energy. This course examines the flow of energy from the sun into the biosphere through plants and into animals, with a focus on humans. Through a combination of research and oral presentations, problem solving, and group discussions, the chemistry behind this energy flow is explored, as are the ways in which energy is used by living organisms. The nutritional requirements required to support these enegry transformations also are considered. Recommended background: high school chemistry. Not open to students who have received credit for CH/ES 108B or CHEM 108A. Enrollment limited to 29. [S] [Q] T. Lawson. A study of some of the most universally used methods and techniques of chemical separation. Both theory and applications are covered. Topics include chemical equilibrium, liquid-liquid extraction, gas and liquid chromatography, and electrophoresis. Laboratory: three hours per week. Prerequisite(s): CHEM 108A. Enrollment limited to 19. [S] [L] [Q] Normally offered every year. T. Wenzel. A study of the wide-ranging aspects of inorganic chemistry. The use of periodic trends and fundamental principles of inorganic chemistry to systematize the descriptive chemistry of the elements is explored. Topics include reaction mechanisms in inorganic chemistry, ligand field theory, and solid state chemistry. Applications of inorganic chemistry to biochemistry, environmental chemistry, and geochemistry are also considered. Prerequisite(s): CHEM 108A. [S] Normally offered every year. G. Laurita. CHEM 217. Organic Chemistry I/Lab. An introduction to organic chemistry. Topics include bonding, structure, stereochemistry, and nomenclature; reactions of alkanes, alkylhalides, alcohols, and ethers; and spectroscopic methods. Laboratory: three hours per week. Prerequisite(s): CHEM 108A. Enrollment limited to 49. [S] [L] Normally offered every year. A. Kennedy, J. Koviach-Côté. CHEM 218. Organic Chemistry II/Lab. A continuation of CHEM 217. The reactions of alkenes, alkynes, carbonyl compounds, aromatics, and radicals are studied from both a mechanistic and a synthetic point of view. Laboratory: three hours per week. Prerequisite(s): CHEM 217. Enrollment limited to 49. [S] [L] Normally offered every year. A. Kennedy, J. Koviach-Côté. CHEM 223. Analytical Spectroscopy and Electrochemistry. Spectroscopic and electrochemical methods employed in chemical analysis are discussed. Topics include ultraviolet, visible, infrared, and atomic spectroscopy; and potentiometric and voltametric methods of analysis. Prerequisite(s): CHEM 217. [S] T. Wenzel, X. Xu. Major topics include quantum mechanics, atomic and molecular structure, and spectroscopy. Prerequisite(s): CHEM 108A, MATH 106, and PHYS 107. Corequisite(s): PHYS 108 and MATH 205. [S] [Q] Normally offered every year. M. Côté, L. Mandletort. Major topics include statistical mechanics and chemical thermodynamics. Prerequisite(s): CHEM 108A, MATH 106. Prerequisite(s) or corequisite(s): PHYS 107. Alternates with CHEM 310. Enrollment limited to 32. [S] [Q] Normally offered every year. M. Côté, L. Mandletort. BI/CH 304. Biochemistry of Virus Replication and Host Cell Defense Systems. Viruses that infect eukaryotic cells have evolved a wide range of strategies to co-opt the biochemical machinery of host cells for the purpose of maximizing virus replication success. Eukaryotic cells have simultaneously evolved mechanisms to limit the extent to which viruses can establish successful infections. This course examines, in large part through the primary literature, the replication biochemistry used by representative examples of mammalian viruses and the cellular biochemical pathways designed to defend cells and organisms from viral takeover. Students are expected to apply what they learn by preparing a grant application narrative as a final project. Prerequisite(s): BIO 242 and CHEM 218. New course beginning Fall 2019. Enrollment limited to 15. [S] T. Lawson. CHEM 306. Electrons in Solids. A study of the electronic properties of solid materials. Subjects include the application of quantum theory to simple models of crystalline solids, the chemical and optical properties of solids, the impact of surfaces on material behavior, and quantum confinement. Prerequisite(s): CHEM 301. [S] [Q] M. Côté. CHEM 308. Topics in Physical Chemistry. This course explores topics in physical chemistry beyond those encountered in Quantum Chemistry. Topics are drawn from the following: theoretical aspects of spectroscopy, molecular structure and dynamics, and condensed matter. Computation for modeling and visualization is emphasized. Prerequisite(s): CHEM 301, MATH 205, or PHYS 308. Enrollment limited to 29. [S] [Q] M. Côté. This course is an overview of physical chemical principles and techniques used in understanding the properties, interactions, and functions of biological molecules. Thermodynamic, kinetic, and statistical mechanical principles are applied to understanding macromolecular assembly processes (i.e., assembly of viruses or ribosomes) and macromolecular interactions involved in gene expression and regulation, DNA replication, and other biological processes. Techniques used in studying protein folding, RNA folding, and enzyme kinetics are presented. Prerequisite(s): CHEM 108A, PHYS 107, and MATH 106. Alternates with CHEM 302. Enrollment limited to 32. [S] [Q] Normally offered every year. P. Schlax. CHEM 313. Spectroscopic Determination of Molecular Structure. In this course the utilization of nuclear magnetic resonance (NMR) and mass spectral data for structural analysis is developed. Particular attention is given to the interpretation of proton, carbon-13, and two-dimensional NMR spectra, and to the interpretation of fragmentation patterns in electron-impact mass spectrometry. Theoretical and instrumental aspects of modern NMR spectroscopy and mass spectrometry are covered. Prerequisite(s): CHEM 218. [S] J. Koviach-Côté, T. Wenzel. CHEM 316. Advanced Topics in Inorganic Chemistry. A study of selected advanced topics in inorganic chemistry. Emphasis is placed on the application of group theory to the elucidation of electronic structure. Selected topics may also include bioinorganic chemistry, inorganic materials, and inorganic reaction mechanisms. Opportunities for critical reading of the current literature are also presented. Prerequisite(s): CHEM 215. [S] G. Laurita. CH/NS 320. Mechanisms of Memory. This course engages students in ideas from the fields of neuroscience, chemistry, biology, and psychology to understand on a chemical level how memory is stored and recalled in the human brain. Using seminal experiments as a foundation, students differentiate between “learning” and “memory” and connect model systems from the molecule all the way to behavior. Multimodal assignments explore the broad scope of experimental design and the cutting-edge subtleties of what it means to store and access information in the brain. Prerequisite(s): BIO 242 and CHEM 217. [S] A. Kennedy. CHEM 321. Biological Chemistry I/Lab. An introduction to biologically important molecules and macromolecular assemblies. Topics discussed include the structure and chemistry of proteins; the mechanisms and kinetics of enzyme-catalyzed reactions; and the structure, chemistry, and functions of carbohydrates, lipids, nucleic acids, and biological membranes. Laboratory: three hours per week. Prerequisite(s): CHEM 218. Recommended background: BIO 242. Not open to students who have received credit for BIO 321. Enrollment limited to 26. [S] [L] [Q] Normally offered every year. C. O'Loughlin, P. Schlax. CHEM 322. Biological Chemistry II/Lab. A survey of the major metabolic processes in living cells. Topics discussed include protein synthesis, DNA replication and gene expression, the global organization of metabolic pathways, carbohydrate and fatty acid metabolism, biological oxidation, reduction and energy production, and the metabolism of nitrogen-containing compounds. Special attention is given to the mechanisms by which metabolic processes are regulated. Laboratory: three hours per week. Prerequisite(s): CHEM 321. Enrollment limited to 36. [S] [L] [Q] Normally offered every year. T. Lawson, P. Schlax. CHEM 325. Advanced Organic Chemistry. A study of important organic reactions with emphasis on structure, stereochemistry, mechanism, and synthesis. Prerequisite(s): CHEM 218. [S] A. Kennedy, J. Koviach-Côté. An investigation of the structure of organometallic compounds (compounds with transition metal-carbon bonds) and their use as catalysts. Emphasis is placed on mechanisms of reactions, as well as tuning reaction conditions to achieve desired results. The synthetic utility of such reagents for the bench chemist is investigated along with a few select biological examples of organometallic catalysts (e.g., vitamin B12 and iron-containing oxygenases). Examples from the current literature are used, and students have the opportunity to present on a current topics in the field. Prerequisite(s): CHEM 215 and 218. Staff. CHEM 337. Natural Products and Secondary Metabolites as Drugs. Over a third of all FDA-approved drugs originated as natural products originally made by mammals, plants, and microbes. As sequencing technologies have improved our ability to peer into genomes, there is a renewed hope that this genomic revolution will drive an expansion of drug-like natural products. In this course, students explore the biochemical pathways for the production of secondary metabolites, relate their synthesis to primary metabolism, and explore the clinical trial process. They discuss natural product biochemistry, assay development, clinical trial planning, patient recruitment, and how natural products have shaped human history. Recommended background: BIO 242 or CHEM 321. Prerequisite(s): CHEM 218. New course beginning Winter 2019. Enrollment limited to 19. C. O'Loughlin. A laboratory or library research study in an area of interest under the supervision of a member of the biology or chemistry department. Senior majors deliver presentations on their research. Students register for BIOC 457 in the fall semester and BIOC 458 in the winter semester. Majors writing an honors thesis register for both BIOC 457 and 458. [W3] Normally offered every year. Staff. CHEM 457. Senior Research and Seminar. A laboratory or library research study in an area of interest under the supervision of a member of the department. Each senior major delivers one presentation on the research for each thesis credit. Students register for CHEM 457 in the fall semester. Majors writing an honors thesis register for both CHEM 457 and 458. [W3] Normally offered every year. Staff. A laboratory or library research study in an area of interest under the supervision of a member of the biology or chemistry department. Senior majors will be asked to deliver presentations on their research. Students register for BIOC 457 in the fall semester and BIOC 458 in the winter semester. Majors writing an honors thesis register for both BIOC 457 and 458. [W3] Normally offered every year. Staff. CHEM 458. Senior Research and Seminar. A laboratory or library research study in an area of interest under the supervision of a member of the department. Each senior major delivers one presentation on the research for each thesis credit. Students register for CHEM 458 in the winter semester. Majors writing an honors thesis register for both CHEM457 and 458. [W3] Normally offered every year. Staff. CHEM s11. The Natural Science of Honeybees. The study of honeybees has led to greater scientific understanding of subjects as diverse as social behavior, aerodynamics, chemical communication, and developmental biology. In this course students explore historical scientific discoveries in the natural sciences while studying the life cycle of the honeybee. This laboratory course introduces techniques used to monitor the health of honeybees. Laboratory and field work may include examination of bees in various stages of development, analysis of wax and honey for the presence of antibiotics and/or pesticides, use of molecular biology and microscopy techniques to identify pathogens. Prerequisite(s): BIO 190 or CHEM 107A Open to first-year students. Enrollment limited to 18. [S] [L] P. Schlax. BC/SP s23. Intersection of Biomedicine and Human Rights: The Case of the Chilean Mining Experience. This course explores the intersections between natural scientific inquiry and cultural studies. Through historical, scientific, cultural, Literary and bioethical lenses, students examine biomedical science in Latin America and the struggle for civil, human, and health rights by workers in the Chilean mining industry since the nineteenth century. The study of historical and cultural narratives alongside the application of the scientific approach to problem solving and laboratory experimentation provide students with a foundation for further on-site examination the impact of scientific practices on human populations, and the intererconnectedness of state policy, public health, and human welfare. Prerequisite(s): SPAN 210. Enrollment limited to 17. Instructor permission is required. [S] [Q] T. Lawson, C. Aburto Guzmán. BI/CH s24. Introduction to Scanning Microscopies. Many of the recent advances in microscopy have been based on scanning a probe, which can be a light beam, electron beam, or mechanical tip, across a sample. This course provides hands-on experience with, and a discussion of the theory underlying, scanning microscopies. Students learn to use a scanning electron microscope and a confocal microscope and complete an individual project. Prerequisite(s): one of the following: CHEM 107A, 108A; PHYS 107, 108. Enrollment limited to 14. M. Côté. CHEM s37. Advanced Chemical Measurement Laboratory/Lab. The use of spectroscopic methods to probe atomic and molecular structure, and to identify, characterize, and quantify chemical species is examined. Measurements of thermodynamic and kinetic parameters describing chemical reactions are performed. Theoretical and experimental aspects of several techniques including nuclear magnetic resonance, infrared spectroscopy, and UV-visible spectroscopy are covered. Prerequisite(s): CHEM 301, 302, or 310. Enrollment limited to 29. [S] [L] [Q] P. Schlax, M. Côté. CHEM s42. Chemical Synthesis and Reactivity/Lab. Multi-step synthesis, reactivity, and characterization of complex inorganic and organic molecules. Working independently, students carry out week-long experiments designed to introduce important techniques in modern organic and inorganic chemistry. Concepts covered include stereoselective reactions, air sensitive syntheses, and purification techniques. In addition, students gain hands-on experience with a wide variety of instrumentation used for compound characterization. Emphasis is placed on proper techniques in laboratory work, safety, waste handling, and communicating experimental approaches and results. Prerequisite(s): CHEM 215 and 218. Enrollment limited to 15. [S] [L] Staff. CHEM s51B. Designing Experiments in Inorganic Chemistry. 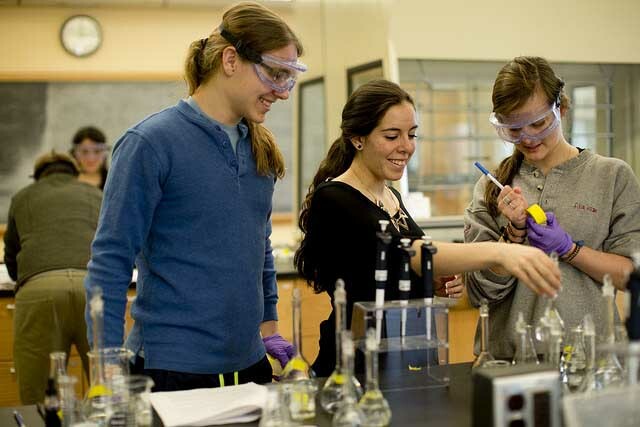 Students assist in the redesign of CHEM 215, Inorganic Chemistry, to incorporate a laboratory component into the course. Students conduct research on experimental techniques and their applications in inorganic chemistry, and perform experiments using these techniques. Students assist in deciding which experiments will be incorporated into the inorganic curriculum based on concepts addressed in the lecture component. Prerequisite(s): CHEM 215. New course beginning Short Term 2019. Enrollment limited to 6. Instructor permission is required. G. Laurita.